The old ‘Top School’ has been converted to make a permanent home for Boscastle Pre-School Play Group, providing the Play Group with indoor and outdoor environments, with wonderful and varied play areas, that are amongst the best in England. The indoor design is carefully tailored to the Play Group’s needs, in particular the large areas of sliding glass to the rear providing excellent “Free-flow” play to fulfil the playgroup’s aspirations. The newly-refurbished and extended stone hall now also provides improved facilities for the neighbouring Primary School, and Boscastle village community, who have previously only used it on rare occasions due to its difficulty to heat and semi-derelict state. Eco credentials include a locally-sourced douglas fir frame, recycled newspaper insulation, recycled timber floor, rainwater collection, bio-diverse garden and East facing glazing to catch the morning sun. 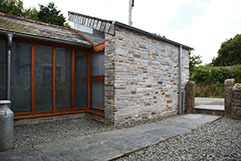 All the craftsmen and builders involved came from Boscastle or neighbouring villages, and worked with great dedication to produce a beautiful building of which the whole village and we at Innes Architects are immensely proud of. 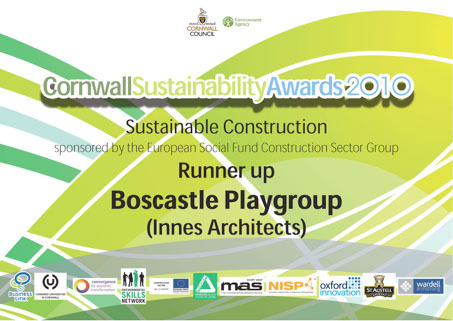 For the project to be awarded Runner up in the Cornwall Sustainability Awards 2010 clarifies the hard work and dedication by all involved, whether they were part of the design and construction team or valued members of the local community. From consultation with parents, children, Primary School and the community, the design for the new Play School focused on promoting access & equality, safety and enjoyment. 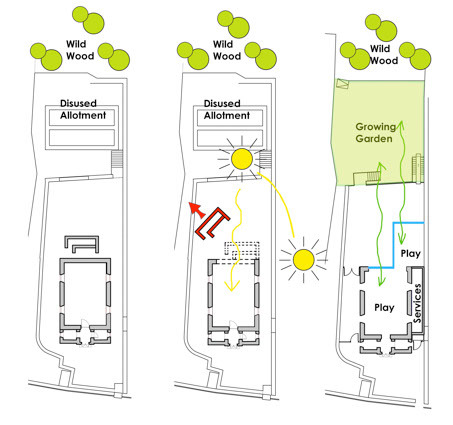 Central to the brief was the concept of 'Free Play' - encouraging children to form a healthy relationship with the natural world by minimizing barriers between inside and outside. The design opens up the entire east gable end of the old Hall and extends the play space out towards the gardens. It retains the integrity of the stone building whilst maximising glazing and natural light, with the interior and external play areas connected via invisible, level thresholds. The scheme includes a high-specification wheelchair-accessible WC for staff and children, and children have their own low-level kitchen for wet play. The Growing Garden is wheelchair accessible via a new level side gate, and carefully landscaped to allow freedom of movement via gently sloping paths. The Play School front entrance is used by the community and Primary School, while a new Garden entrance is solely for the Play Group's use, offering the children full safeguarding and security. Full Article in the October issue.